The musical group Vas has a goal to create a new definition of 'world' music. From their stunning debut recording Sunyata to the progressive and diverse Feast Of Silence they have woven together a subtle sound tapestry of otherworldly spiritual verve and atmosphere that sets them apart from almost everyone else. 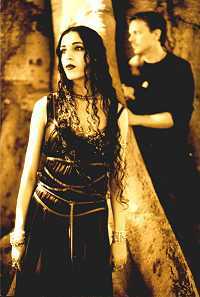 Founded in Los Angeles in November 1995, they signed a record deal with Narada in 1997, and we have been mesmerised ever since. Singer Azam Ali, who was born in Iran and grew up in India, has the most beautiful, ethereal voice in music today (only Uzbekistan vocalist Sevara Nazarkhan comes close). It is a voice that can make the soul shudder in remembrance of its former self. She is also a very talented hammered dulcimer and Santour player and has studied for five years with Persian Santour master, Manoocher Sadeghi. She also recorded a wonderful solo record, Portals Of Grace for Narada records and both Greg Ellis and Azam Ali contributed to the splendid 2003 Triloka Records recording Hookah Café which included other such renowned world artists like Egyptian musical legends Hamza El Din and Hossam Ramzy, Palestine's Simon Shaheen, India's Jai Uttal and Senegal's Youssef el Idrissi. Greg Ellis grew up in Los Gatos, California. He began playing the drums at age 13 and studied classical percussion while attending San Jose State University. He eventually felt constrained musically by the school's rudimentary approach to percussion and left for Los Angeles in 1984. He began his musical career touring and recording with such artists as David & David, Mark Curry, and Billy Idol's guitarist, Steve Stevens. Ellis even appeared on a VH1 reunion special with Idol and Stevens. His percussion work is the backbone of the Vas sound. He has also ventured into the solo artist realm with the wonderful recording, Kala Rupa - Explorations In Rhythm, also on Narada records. 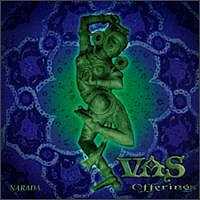 Vas is coming off a wonderful couple of years that saw them record two very excellent solo albums, and perform as backup musicians with Mickey Hart on his world tour. If it were not for the sudden passing of Azam Ali's mother in Iran and Ali's subsequent return to Iran to take care of her family's affairs, things would have been perfect. What influences have found their way into your music? What musicians' work inspired you the most? Why? AA: Having been born and raised in the east has probably shaped me both as a person and artistically as well. Although Persian music was the first music I ever heard, my strongest early memories of music are the Indian devotional chants and songs I heard from the Hindu temples in the little town I grew up in India. Even though I don't approach singing in a traditional way, my intent is directly influenced by Indian music, in terms of its sadness and deep sentiment of longing. And when I came to the west I discovered the music of Hildegard of Bingen and other music of that time period and I found those same sentiments in that music as well, even though it was a world apart. Medieval music is most responsible for me pursuing singing seriously and really working on my voice, because in order to sing that music your tone has to be so pure like a bell and that takes work. As far as artists go, I have been influenced by too many to name individually. GE: I find myself being more influenced by a great performance than a particular style or technique. The ones who really taught me are Miles Davis, John Coltrane, Ravi Shankar, and tabla master Zakir Hussain to name a few. Live performance is where it's at though. That's the only way you're able to experience the soul of a musician. All traditional and classical ethnic music exhibits this. All great jazz and rock records as well are all based around live performance. I'm more inspired than influenced by musicians. A friend once told me that his shamanic circle listens to Vas recordings to help cleanse the mind of clutter and become more focused on the spiritual. Do you agree that your music has an underlying spiritual verve to it? GE: I think if it does, it's merely a reflection of our own devotion to our music. To me, any music in its pure form is spiritual, as long as the performer is clear in his or her intent. We do what we do without any preconceived notion of where it will end up, and we really try to keep that element of discovery throughout our recordings so each time you listen, you find something new. I love the fact that people are responding to our music on that level. AA: For us, the process of writing and recording our music is like an exorcism. It is in the process of doing that, that we are able to undo our spiritual blocks and work through our fears and pains and undergo huge transformations. My need to do music is basically a selfish one; I would go insane if I didn't. For me singing is like praying, no different. And the fact that I don't sing lyrics I think allows the listener to roam freely in that realm without having to think about what I'm saying. And of course the power of rhythm is something that is just beginning to be explored here in the west. Greg, your percussion style possesses a tribal, almost shamanic feel to it. Have you studied ritual or shamanic drumming? GE: My entry into the incredible power of drums and rhythm was Mickey Hart's book, Drumming At The Edge Of Magic. His bibliography and recommended l listening sections alone are worth getting the book. I would go down the lists book-by-book, CD-by-CD, and discovered a whole universe of rhythm. It changed my life. Each CD I found was like a masterclass in whatever style of music it was. The one that sent me over the top though was The Master Musicians Of Jajouka. There was something in those rhythms that resonated in my soul. It tranced me out for days. That was the first of many experiences to follow. I got into the power of long repeated phrases. I heard rhythm differently after that and my playing took on a completely new dimension as well. I began using rhythms in the same way a mantras and chants are used. Up until reading that book I was only playing drum set. I rarely touched any hand percussion. I think I inherently knew how deep these drums would take me and it scared me a bit. As Azam said, the power of rhythm is just beginning to be tapped into here in the west. The book talks about the responsibility a drummer has to get into 'the Zone' as he calls it. That's the place where your body attunes itself to the pulse of the rhythm being played and that's when it feels like you've entered into an altered state of consciousness. This can happen with any kind of music. Greg, you have described your music in the press before as 'Alternative World'. What is your definition of alternative world music and who else do you believe is on the cutting edge of this new musical sub-genre? Have you ever listened to other Alt-world groups such as the Afro-Celt Sound System? GE: Alternative World is music that is neither geographically nor culturally specific, yet incorporates elements of many cultures. There are so many artists out there who would fall under that category. Afro-Celt Sound System definitely fits. There is a great group from England called Alien Soap Opera that is co-produced with the great Egyptian musician Hossam Ramzey that blends electronic and traditional music beautifully. Talvin Singh is another great example of that. There is a group Ekova, whose singer sings in her own language, and uses Persian percussion. In Turkey there is a group called Kardes Turkuler that is just incredible. It also would help artists from other countries to be found in a category other than their country of origin. I have never viewed Vas music as, dare I say it, 'new age'. I have always seen your music as more eastern in flavour, and possessing far more spiritual depth than most standard new age music. Has it been a struggle to break free of this unfair label? GE: It started because retail stores just assumed any Narada release would be a New Age record. At first it was very frustrating but now all we care is that our music gets out and whatever category it's found in ultimately doesn't matter, as long as it's in the store. AA: It has been a struggle no doubt, but in the end I think the music speaks for itself. There will always be the purists who will negate our work, but for me personally when I love a band and I go the record store to buy their album, I couldn't care less what section it is filed under. Azam, you learned to play Santour (an instrument similar to hammered dulcimer) when you were young. You then progressed on to becoming a very skilled hammered dulcimer player. What motivated you to learn the Santour and hammered dulcimer? Have you ever thought about doing a solo hammered dulcimer recording? AA: When I turned 19 I decided I wanted to learn to play an instrument and I wanted it to be something unusual. I didn't really have any interest in learning any Persian classical music, but I loved the sound of the Santour and since I love percussion so much it seemed to be the most natural choice for me because it is such a percussive instrument. My teacher, Manoocher Sadeghi, was a family friend of ours, and his son, and used to hang out in the same circle, and one day I was over at their house and as soon as I saw the Santour I knew immediately that I had found my instrument. The progression to the hammered dulcimer was quite natural, because it is so much more durable than the Santour. Instead of four strings per note it has two, so for live purposes and travelling it works much better, but also for me the Santour sounds so classical, more like a piano, whereas the dulcimer sounds more folky and raw which suits our music better. I have never thought about doing a solo dulcimer record. I have just resumed studying with my teacher again and I have two more years of intensive work ahead of me, so until then I am still a student. 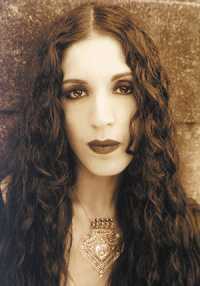 Greg, I know you were the drummer for Steve Stevens, Billy Idol's guitarist as well as other rock acts. What advice would you give to any aspiring musician wishing to break into world music or the music business in general? GE: Assuming an aspiring musician has the talent and fortitude necessary for whatever facet of the business they're trying to break into, so much of it is just being in the right place at the right time and always being ready for any opportunity that arises. The trouble is that there isn't any logic to the music business. I would give very different advice to someone looking for a record deal than to someone looking to be a sideman or session player. The hardest thing for me when I moved to Los Angeles was deciding which direction I wanted to go. The trick is training your intuition to be focused solely on the goal at hand and don't get distracted. The ability to adapt to any situation helps as well. It's hard to narrow it down to a few sentences. I love talking to young players one-on-one about this because then I can really share my experiences extensively. Greg, what was the situation with a producer of a hunting documentary using a Vas song as background music during the gutting of an animal? Did this shock you that someone would use your music in such a visceral way? GE: It was actually a PBS film based on the life of a hunting guide in Montana. I was hired to compose the music. When I met with the director, he told me he had been using our song Refuge from our first album in a scene of the hunters gutting a deer. At first it did shock me quite a bit. I saw it out of context and I have my own visual of the song, which is the polar opposite of what this scene depicted. I had worked with the director before and he said that if it upset us too much he wouldn't use the song. When I finally saw it in context though it really did work. It was almost like the song became a prayer for the soul of the animal. It was pretty intense. Azam, I know you sing the lyrics of your songs, using your own developed language (I call it, "the language of a whispering soul," because it seems as if you tap into the spiritual 'ba' of the universe when you sing). What is the inspiration for those words? Do they just flow from you in a phonetic sense and then you sing them as you here them? AA: When I work on a song, the first thing I do is press the record button and completely let myself go. Then I go back and listen and I look for those moments when I feel I have tapped into the emotion I want to convey, and the words and melody that I have used there become the frame work from which I start to weave the song. I then experiment with every sound and syllable until I find the one that expresses the melody best, because my ultimate goal is to express the melody and not have it be encumbered by words. Greg, I have heard that you have a rather sizable percussion collection from around the world. How many pieces do you have and what is the most unique instrument in the collection? GE: It's growing all the time. I have over 100 pieces from over 20 countries. I can't stop! Each drum has such a unique voice and history. The most unique I would say is a horn I got in Nepal called a Kangling, which is a hollowed-out leg bone, wrapped in silver and copper wire. Describe your creative process when it comes to writing for a new recording. Is it something that just flows from you or is it more of a start-and-stop kind of procedure based upon your muses? Do you do any research for your songs, musically wise, or conceptually wise? AA: As I mentioned earlier, the beginning of the creative process is all about letting go and improvising until I tap into the soul of a piece, because music has a life of its own, it cannot be created or steered in a direction it does not want to go. It is a force that is already there, and if you don't think about it too much and just let it take you, instead of the other way around, then it creates itself. For us it is all about tapping into the soul of a piece and sometimes that happens right away and sometimes it wants to be left alone and it takes time. We never conceptualise our music although we do draw inspiration from records that we both love. GE: Once we do tap into something, then it's about finding the right combination of instruments that work with and support the melody. It's definitely about connecting to the muse. The hardest part is usually deciding when a piece is complete. The most magical part for us is hearing something back and saying it's done. Actually I think it was Artie Shaw who said, "...a work of art is never finished, only abandoned." If you are unfamiliar with their music, please do yourselves a big favour and go to the record shop today and purchase copies of Sunyata, Offerings, In The Garden Of Souls and Feast Of Silence as well as their solo records Portals Of Grace and Kala Rupa - Explorations In Rhythm. Your ears, heart and spirit will thank you for it!